You know when you get going on a project, get REALLY excited, make huge strides and then... quit? Yeah, well, that's sort of what happened to our basement makeover these past couple of months. We have a bunch of ideas that we want to implement down in this space, but feel like we don't want to commit to anything quite yet, until we have our furniture in place. 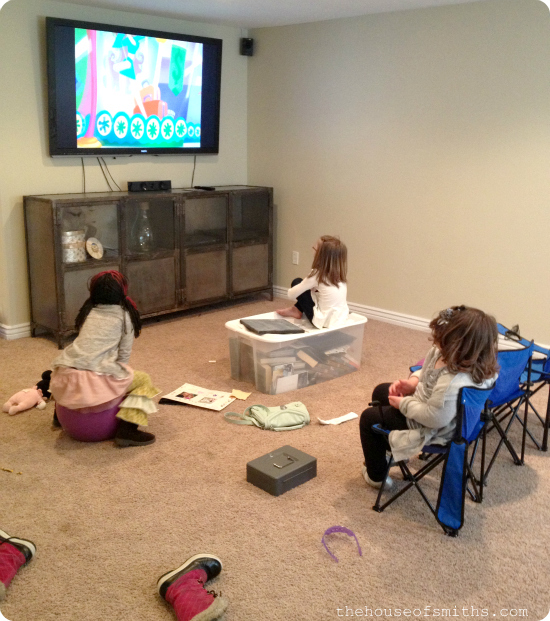 Aubrielle: "Hey friends, wanna come watch a movie at MY house? You can sit on a broken camping chair, a bouncy ball or even an old storage container!" Sadly, this scene above has been the norm for the past couple of months while we've been deciding on furniture styles and colors for this space. Typically, when it comes to big purchases we take a LOT of time deciding, finding exactly what we need/love, saving our money... and only THEN do we jump in with both feet. As I mentioned before, Cason has been really opinionated (in a good way), with this basement makeover and he's challenged me to step outside of my comfort zone and try something new. Typically I would go for lighter, airier colors, (whites, light blues and yellows) like in our living room upstairs, but we both thought that it would be fun to dip our toe into a completely different color scheme that we think could be really fun, for this movie watchin', game playin' space! I mean, it's just color, right!? And as long as our couch stays neutral, changing up everything else is a cinch and a lot less expensive. Since we wanted our textiles to be really unique and custom, we chose to work with The Black Goose Design again. 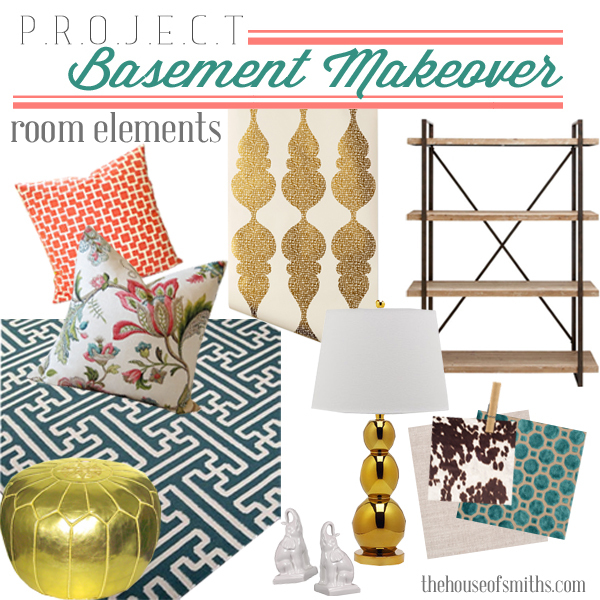 We loved working with them for our kitchen redesign, so it was a no-brainer when we were deciding where to purchase the bigger pieces for our basement. 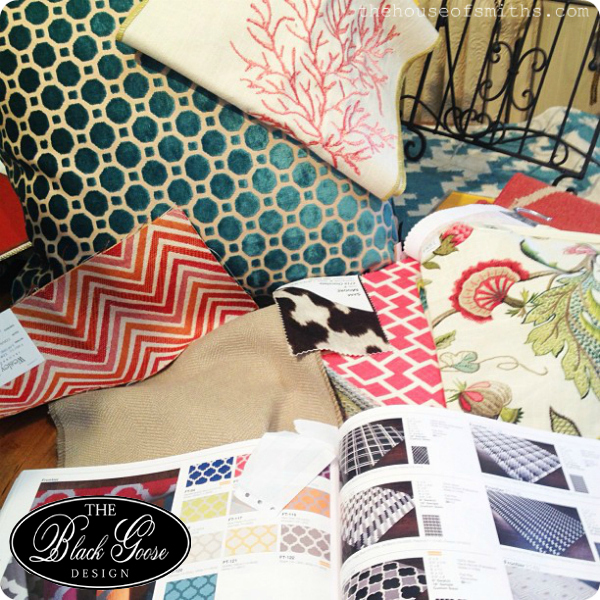 The good (and sometimes bad) thing about an actual design shop, like The Black Goose, is that they have EVERY fabric, rug and furniture style under the sun! Good, because you don't have to run around town (or the internet) looking for each individual piece of your design plan, but bad, because if you DON'T have some sort of plan in mind, you can get overwhelmed with choices really fast. This may or may not have happened to me. Luckily, between Cason and Brooke (who is the manager and one of many design consultants at the store), we were able to reign in my indecisive decorating ways pretty quickly. Once we decided on a definite color scheme, things moved really fast! I'll admit that I was hesitant and unsure about our choices as we flipped through the bold, rich, fabrics one by one; but once everything was laid out on the table, I started to get really excited!!! The thing I love about a really good design shop/consultant, is that they're not there to tell you how you should decorate, or exactly what they think you should choose; they're just onlookers with lots of resources who standby and help make suggestions that you may not have considered, once they see what direction you start gravitating towards in your design decisions. I feel pretty well versed in room layouts and pattern mixing, but when I started the process of making concrete decisions and spending money for my OWN blank space and not someone else's, I felt like all of my prior knowledge flew out the window, and in it's place was doubt and second thoughts. I wonder if even the greatest interior designers sometimes go through feelings like these? Anyway, after a lot of sifting through fabrics and gathering inspiration that BOTH Cason and I loved... we came up with this little mood board. Now is that different or WHAT!? Our bigger, custom pieces came from The Black Goose, and they actually arrived not too long ago! The room is slowly coming together, and with each item that I add I'm diggin' this eclectic mix of beautiful color and fabric choices more and more! Eeek! We're pretty much maxed out on the bulk of our budget right now, but are STOKED we took the plunge to invest in high quality, long lasting furniture that we can use for years to come. We haven't quite got things where we want them, so we'll be pulling the parts of the room that we DO have, together this week/weekend and will show you all what it looks like so far, on Monday! I love your inspiration board. Can't wait to see what you've done so far. I'm so stoked! this is going to be awesome. Super fun! I love the fabric choices and can't wait to see where you go with this! And I totally get what you mean about big furniture purchases...it takes us forever to make up our minds and bite the bullet. Sometimes that works in our favor, though! Eight years ago I spotted my dream dining table at Pottery Barn, but the cost made me gulp, and we never made a decision on any alternate choices. Guess what I found on Craigslist a couple weeks ago? Yep, my dining table...at a fraction of what I would have paid eight years ago. I LOVE colors! It'll be a great space for games and movies and for the kids to play in. I'm SO jealous!! You got the rug I have been coveting for many months now! Looking good! How exciting to go bold! I am usually a grays and blues girl too, but I think it will look great! Ooh that is one stunning mood board! I can't wait to see it all come together. I know it will be fabulous! Hope you're having a wonderful week! Oh my gooooooooosssssshhhh! This is going to be epic! I love those colors and textures. That gold is going to be so yummy in there. Can't wait to see what you come up with! Love the new color scheme you are going with! Sometimes it is hard, but in the end feels so good to jump out of your comfort zone a bit. You made awesome choices! Before noticing the pile of cushions in the photo left I thought "wow. they have quite possibly picked out the most hideous furniture ever! they must have lost their minds. I'll be it looks a WHOLE lot better with the cushions on it. Anyone else think that? I can't wait to see what you have so far! They had some super cute elephant lamps at World Market!! Love it..cant wait to see the finished project! I love the Rug! Can't wait to see what you have on Monday! It's looking good and colorful. You will love it! I am dying to see it all come together Shelley!!!! YAHOO!!!! 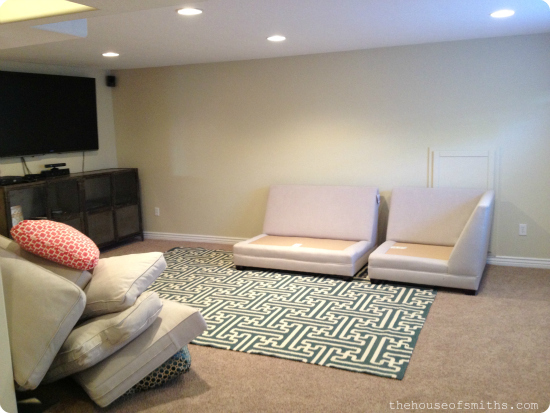 Love the style shift for the basement!!! Not that I'm not OB-SESSED with your lighter airy style upstairs but I think it's awesome to switch it up a bit! Can't wait for the big reveal! I'm so excited that you're going to use bold colors! Of course I adore what you've done upstairs, but I love deep, saturated tones, too. I LOVE your rug and pillows. Jealous. I know it'll be great. I'd love to have your eye for pattern and texture mixing! Exciting! !